With all of the questions surrounding the Baltimore Ravens this off-season, they know they have something special with Marshal Yanda. There is no doubt that the Ravens have problems on the offensive line in 2016. Injuries during the season forced the line to start different combinations all year. Rookies Ronnie Stanley and Alex Lewis were brought in and started most of the season. The inconsistencies were just one of the issues the team had in their 8-8 season. 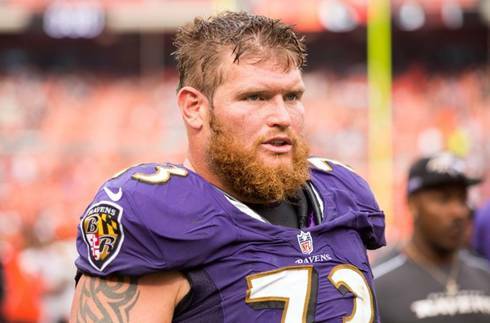 Even with a mediocre season, there is one man who seems to continually get the job done is right guard Marshal Yanda. Yanda was a third round pick in 2007 and has developed into the best offensive guard in the league. He plays at a position where his production can go unnoticed by the casual NFL fan. But if you are Ravens fan or a football expert, you know how good Marshal Yanda is. Teams are lucky if they can find offensive lineman that can either pass or run block. With Marshal Yanda, he has the ability to do both, and he’s really good at it. At 305 pounds, he is a force to be reckoned with. He is the rock that has lead the way in establishing the run game for Ray Rice, Justin Forsett, and now the duo of Terrance West and Kenneth Dixon. His toughness is an intangible that you cannot teach. During last season, Yanda dealt with an excruciating left shoulder injury that he suffered against the Washington Redskins in week 5. As a right guard, it is important to have full use of your inside shoulder. The injury forced him to miss the following two games and it was unsure if he was going to be able finish out the season. Instead of sitting out the rest of the season, when the Ravens came up against the Cowboys in week 10, Yanda made the switch to left guard to keep playing. This way his healthy right shoulder was on his inside. He played out the rest of the season and waited until the off-season to opt for shoulder surgery. His durability speaks for itself. Pro Football Focus has ranked Yanda as the best guard in the NFL in 2014, 2015, and 2016. Before the 2016 season, Pro Football Focus also ranked him as the 13th best player in the league. Keep in mind, this is the league that features players such as Tom Brady, Aaron Rodgers, Odell Beckham Jr. and many more. For an offensive guard to be ranked up there is a testament to how well Yanda has played in his career. Not only is that impressive, but he has racked up numerous of other awards. He was a first team all pro in 2014, 2015, and second team all pro in 2011, 2012, and 2016. He was also elected to his 6th consecutive Pro Bowl this year. All of these awards and honors have been achieved in just 10 years of football. Some players dream of becoming an All-Pro or being elected to a Pro Bowl just once in their career. Yanda signed a four year extension with the Ravens in 2015 and will continue to add to his resume. I will go as far to say that he is as important to the Ravens as Jonathan Ogden was. There is no doubt he will be a in the Hall of Fame once his career is over.